The forest defines the beauty of Summit County. Quaking aspens and tall pines range across the mountain slopes, creating the scenic landscape that draws thousands of visitors every year from cities across the nation and around the globe.What viewers may not know, however, is that 6,000 of those trees have an additional special and personal meaning attached to them. These are all the trees that have been planted as a part of the Bristlecone Foundation Legacy Forest Campaign. A program of the Bristlecone Foundation, a local nonprofit organization that provides hospice and home care, the legacy forest campaign sells seedlings to be planted as memorials to loved ones who have passed away, as symbols of celebration for events such as birthdays and anniversaries, or as gifts to friends and family near and far. The proceeds of the sale go toward the Bristlecone Foundation’s charity program, which benefits under- and non-insured patients. Every year since 2010, the Bristlecone Foundation has planted seedlings in areas in Breckenridge, Frisco, Silverthorne, Dillon and Keystone. This year, an additional 1,800 seedlings will join those ranks. All those planted are native to the Summit County area, including aspens, bristlecone pines, Colorado blue spruce, Ponderosa pines and Englemann spruce.Asa Armstrong, development officer of the Bristlecone Foundation, said the idea for the forest legacy project came from a need for a fundraiser and a desire to make a positive impact on Summit County.”We needed a signature fundraiser for the Bristlecone Foundation and the patients that we serve for Bristlecone Health Services, so we kicked off the campaign in 2010,” Armstrong said. 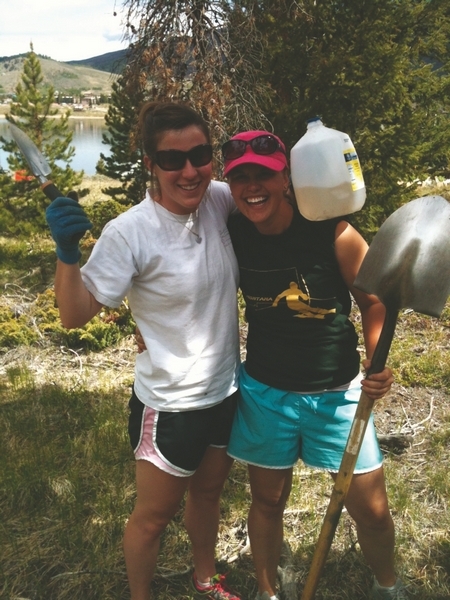 She knew of other tree-planting programs and felt the idea would work particularly well in a mountain community. “I thought, ‘What can we do that actually benefits our community and is also a tribute to loved ones?’ So all the pieces fell together like a puzzle.”Armstrong said that the idea of planting trees was also inspired by witnessing the devastation of the pine beetle epidemic and wondering what could be done to help.”It’s so rewarding to do something hands-on that you know is going to impact your community in so many ways.”In addition to the planted trees, each planting site featured a “reflection rock” with an embedded plaque. With the purchase of 50 or more trees – an equivalent of $1,000 – a commemorative nameplate (“in memorial to,” “in honor of” or “in support of Bristlecone Foundation”) is added to the plaque. The reflection rocks also offer a focal point for people who come to remember the reason they planted their tree. Armstrong and her colleagues picked out the rocks personally.”We sat on all the rocks and made sure they were pretty comfortable, so people could sit and celebrate and think of loved ones,” she said. “Some people need to be with a lot of people and other people need times by themselves.”Often, planters take steps to decorate around the tree itself, placing strings of beads on the branches or circling it with seashells and colorful rocks, something that helps to personalize the space.People who buy seedlings aren’t required to plant them, unless they want to. They can even take them home to plant in their yard, if they so choose. Otherwise, they can join Bristlecone volunteers and other planters at a site in Breckenridge, Frisco, Silverthorne, Dillon and Keystone. The sites don’t always remain the same year to year, depending on space. In the past, trees have been planted on the Frisco peninsula, by the Blue River in Silverthorne, the nature preserve near the lake in Dillon and the Keystone Science School.